The main story from this quarter’s data is of slowing growth. Overall, the index increased by 5.1% year-on-year compared with 6.3% last quarter. This represents the index’s lowest rate of annual growth since the start of 2016. 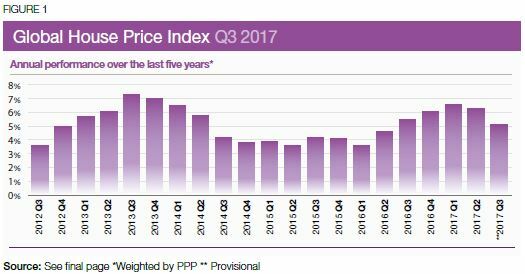 Although nearly nine in every ten of the countries tracked by our index recorded positive annual price growth in the year to September 2017, almost half saw their rate of annual growth decline compared with the previous quarter. The shift was most evident at the top of the rankings table. 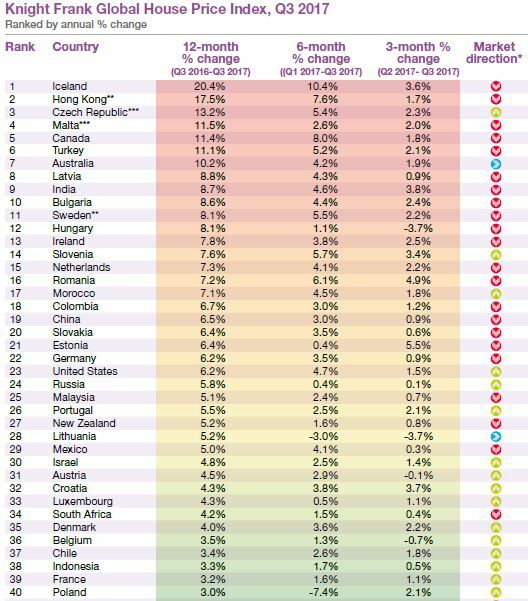 Thirteen of the 15 strongestperforming housing markets around the world registered a slowdown in their rate of annual growth in the year to September. Iceland leads our annual rankings with average prices ending the year to September 20.4% higher, down from 23.2% last quarter. Iceland has now topped our annual rankings for four consecutive quarters. Hong Kong has clung on to second place but data from the Hong Kong Ratings and Valuation Department shows price growth equated to only 1.7% in the three months to September. Estonia, Hungary and New Zealand have dropped out of the top ten this quarter. New Zealand slipped from 10th place to 27th as annualised price growth declined from 10.4% to 5.2%. Tighter lending conditions and plans to introduce a ban on foreign investors in 2018 have potentially reduced some of the speculative activity in the market. This quarter marks the inclusion of Saudi Arabia within the index for the first time. Latest data shows prices slipped 5.4% on an annual basis meaning it is second only to Ukraine as the weakest-performing market. The oil-dependent Saudi economy is struggling to gain traction, which along with the recent introduction of a levy on expatriate workers is stifling housing demand. The US and the UK are following different trajectories, mirroring their economic performance. Average prices in the US accelerated 6.2% over the 12-month period, up from 5.8% last quarter whilst the UK has incurred a marginal dip from 2.8% to 2.6%. The UK market remains highly localised with affordability a key concern in many markets. China has slipped from 12th to 19th position in our rankings. House prices are now rising at their slowest rate for five quarters, up by 6.5% on an annual basis according to the National Bureau of Statistics. European housing markets are firmly back in the spotlight. On average, the region recorded 5.6% annual price growth in the year to September, up from 2.3% three years ago. The good news for Europe doesn’t end there. Greece (0.7%) may finally see price growth reach positive territory over the next quarter after nine years of negative annual growth. Despite Europe’s recent recovery, analysis over a five and 10-year period underlines the extent to which countries within Asia Pacific still rank amongst the highest performers. Data for Australia, Belgium, Bulgaria, Colombia, Croatia, Cyprus, Czech Republic, Denmark, Finland, France, Hungary, India, Israel, Italy, Lithuania, Luxembourg, New Zealand, Romania and Slovakia is to Q2 2017; data for Morocco is to Q1 2017.